Coloured small magnetic rectangular symbols are eye-catchers and can be used for marking content on a whiteboard, planning boards and other magnetic surfaces. Work well for project management, because they can be labeled and re-labeled with water-based markers and moved around as needed. 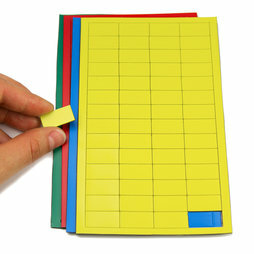 The rectangular shapes measure 1 x 2 cm and are 1 mm thick. They can be easily removed from the foil. The foil itself measures 148 x 89 mm. The colourful magnetic symbols are perfect for project management (especially on magnetic planning boards) or for colour-coding on whiteboards. Of course, they look good on the fridge as well.